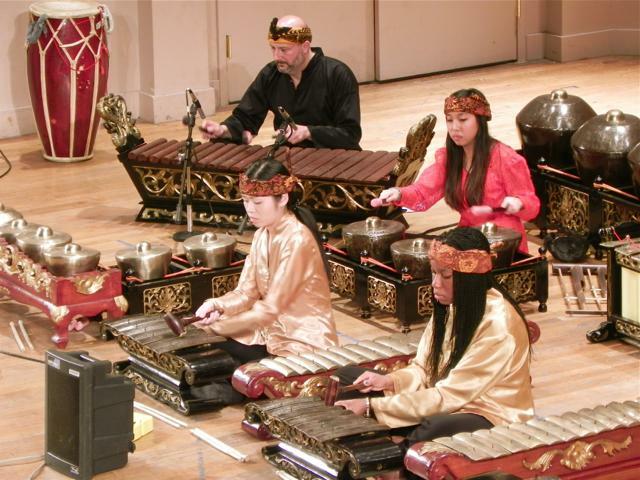 PennsylvAsia: Inspired by Gamelan: Music by Indonesian and Western Composers, April 8 at Pitt. Inspired by Gamelan: Music by Indonesian and Western Composers, April 8 at Pitt. The University of Pittsburgh's Department of Music will present "Inspired by Gamelan: Music by Indonesian and Western Composers" at the Frick Fine Arts Auditorium on April 8. Pitt’s University Gamelan will present “Inspired by Gamelan: Music by Indonesian and Western Composers” on April 8th at Frick Fine Arts Auditorium. Gamelan comprises mainly percussion instruments including tuned gongs, metal-keyed instruments, and drums (as well as bamboo flute and voice). This instrumentation has a unique capacity to saturate the air with resonances that reach from rumbling lows to shimmering highs. The concert will feature student performers and two artists-in-residence: Endang Sukandar and Endang Rukandi. General admission tickets are $8.50 in advance or $12 at the door; Pitt students are free and non-Pitt students and senior citizens pay $5 in advance or $8 at the door. The Frick Fine Arts building is located in Oakland (map), across from Schenley Plaza and the Carnegie Library of Pittsburgh. "Memory as Politics" conference, May 6 at Pitt. Seventh annual Matsuri at CMU, April 11. Rashomon (羅生門) at Tull Family Theater, April 18. New noodle restaurant coming to Squirrel Hill. Documentary The Eagle Huntress at CMU, April 6.